Genuine OEM Lexmark Toner Cartridge, Black, 11,000 page yield. 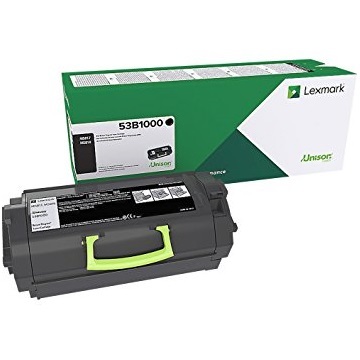 Lexmark part number: 53B1000. Laser Toner Cartridge compatible with Lexmark MS817n, MS818dn. Compatible Lexmark Toner Cartridge, Black, 11,000 page yield. Replaces Lexmark part number: 53B1000. Laser Toner Cartridge compatible with Lexmark MS817n, MS818dn. Compatible Lexmark Toner Cartridge, Black, High Capacity 25,000 page yield. Replaces Lexmark part number: 53B1H00. Laser Toner Cartridge compatible with Lexmark MS817n, MS818dn. Compatible Lexmark Toner Cartridge, Black, Extra High Capacity 45,000 page yield. Replaces Lexmark part number: 53B1X00. Laser Toner Cartridge compatible with Lexmark MS817n, MS818dn.